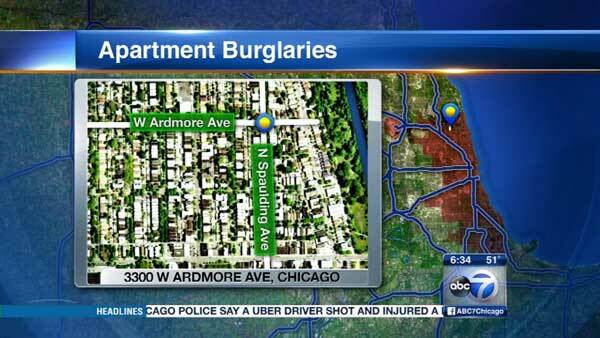 CHICAGO (WLS) -- Police are warning people who live on Chicago's Northwest Side of a string of residential burglaries in the past month. In each case, authorities said thieves got into the apartment or house by forcing a door open. They have gotten away with jewelry, cash, laptops and small electronics. Police said in three of the four incidents, residents were only out of their homes for a short time. In one case, the victim was only gone for 10 minutes. Thieves targeted a home in the 5700-block of North Jersey Avenue around 10:30 a.m. on April 4, another in the 3300-block of West Ardmore Avenue between 6 p.m. and 6:10 p.m. on April 5, another in the 5700-block of North Drake Avenue between 7:10 a.m. and 7:45 a.m. on April 14 and yet another in the 5600-block of North Bernard Street between 10:30 a.m. and 2:45 p.m. on April 17. Anyone with information regarding these residential burglaries should contact Area North detectives at (312) 744-8263.